Those that know me will know I have a bit of a soft spot for frogs. This love for frogs began during my early childhood garden explorations in which I came across the intriguing (if not uninspiringly named) ‘common frog’. I couldn’t tell you what in particular stemmed my original interest with frogs as I haven’t ever managed to put my finger on it. However, after my Zoology degree and a few worldly amphibian adventures, I have many new found reasons for my ongoing fascination. Frogs are remarkable. They are bizarre, evolutionarily distinct, yet hugely diverse. Their colours, shapes, behaviours and general biology is charming. They secrete substances, such as mucus and toxins from glands that can act to defend them from predators. As frog toxins are extraordinarily diverse, biochemists have become very interested in them as “natural pharmacies”. The alkaloid epibatidine, for example, is made by some species of poison dart frog and can be used as a painkiller that is 200 times more potent than morphine. Many environmental scientists understand that frogs act as good biological indicators of broad ecosystem health. This is because of their intermediate positions in food chains, their permeable skins, and typically biphasic lives (aquatic larvae and terrestrial adults). 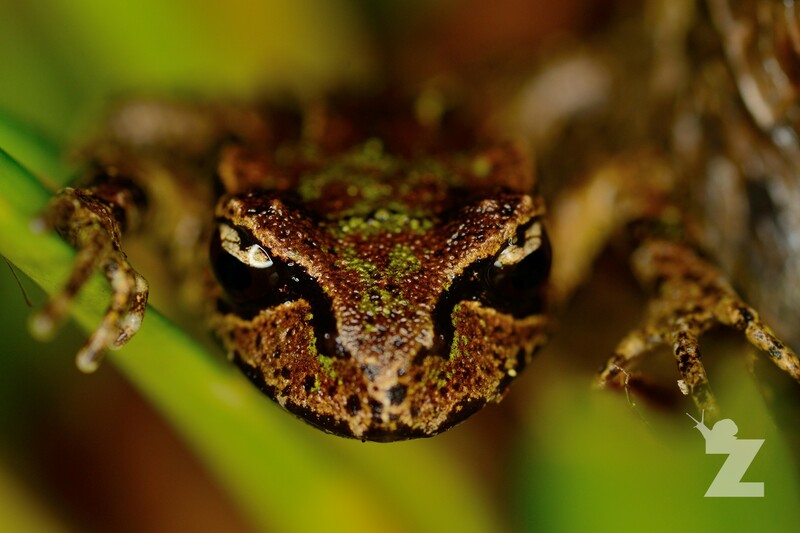 Sadly, frog populations are in decline globally. There are numerous contributing factors, but the main ones are; pollution, loss of habitat and habitat modification, climate change, invasive species, road mortality, over-harvesting for the pet and food trades, and the infectious disease chytridiomycosis which is spread by human activity. Chytrid fungus invades the surface layers of the frog’s skin causing damage to the outer keratin layer. This is particularly devastating for amphibians because their unique skin is physiologically active. They tightly regulate respiration, water, and electrolytes through their skin, and generally do not do well if this is restricted. IUCN Redlist assessments have shown that 32% of the worlds amphibian species are threatened (1,856 species). Amphibians have been in existence for 300 million years, yet in just the last two decades there has been a devastating number of extinctions. 168 species are believed to have slipped over the edge and are now extinct. 2,469 species, that’s 43% of all species have populations that are declining. 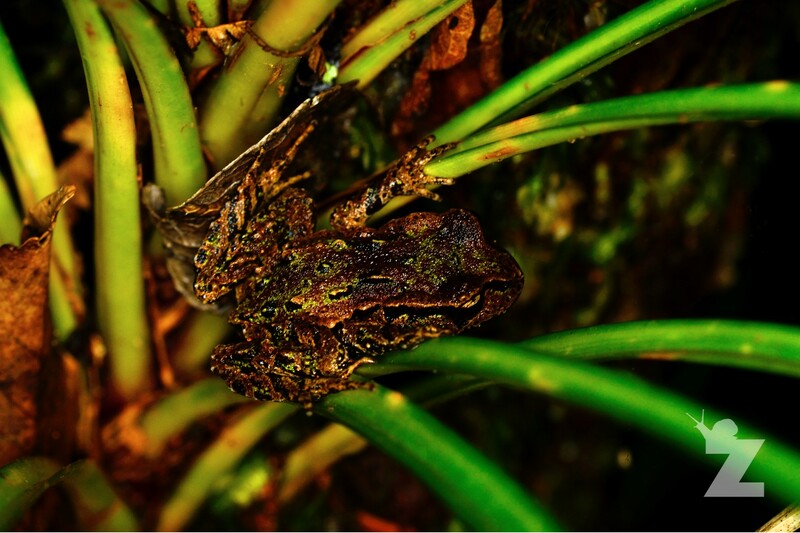 New Zealand has four remaining native frog species; Maud Island frog, Hamilton’s frog, Hochstetter’s frog and Archey’s frog. To see any of them in the flesh is a privilege, especially to see them in the wild as there are so few of them. So, I need not tell you how excited I was to visit some friends residing in one of the only places in the world where I could get to see the world’s most evolutionarily distinct and globally endangered amphibian species, the Archey’s Frog. My expectations for coming across even a single Archey’s were pretty low. On arriving at the location and seeing three Morepork on the main track, my hopes were somewhat lifted. The forest was unspoilt and full of life. From leaving the house to finding our first Archey’s took literally 5 minutes and 30 steps. Our friends and guides knew where and what to look for. They were super-hot on spotting these tiny frogs. We were spot-lighting looking in tree ferns, on logs and in kie kie. Once spotted, the frogs employed their surprisingly effective defense mechanism. They remained deadly still. With lack of movement, small size, camouflage colouration and not making a single vocalisation (there being no point as they lack eardrums), finding them on our own would have been very difficult. With the help of our keen eyed friends, we managed to find 12 individuals. I was blown away by how fortunate we were. Why is the Archey’s Frog so Special? 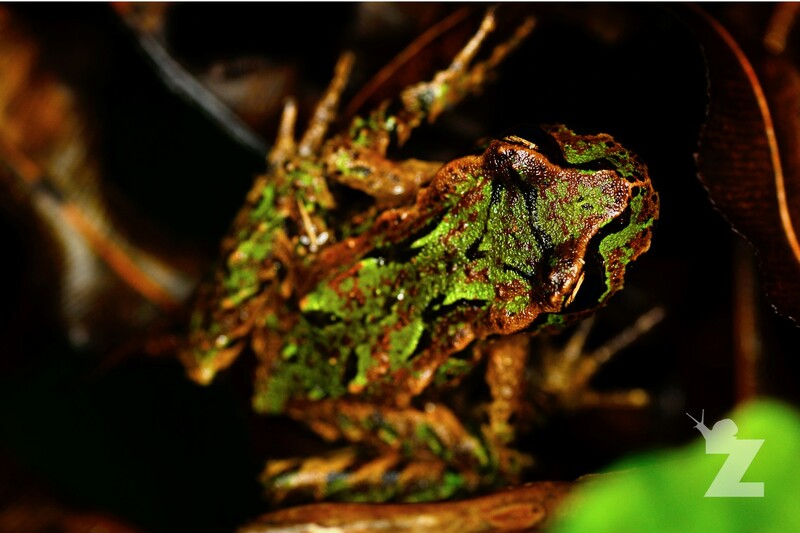 The Archey’s frog is ranked highest on the EDGE list and IUCN classify this species as critically endangered. This species is indistinguishable from fossils found over 150 million years ago. Being a so called ‘living fossil’, the Archey’s frog has some primitive features. This frog has no eardrums, and therefore does not communicate using vocalisations, but is thought to employ scent, releasing pheromones to communicate. Some research also shows that they may also communicate using visual cues. Their eggs are laid in moist leaf litter and are guarded by the male frog. When the young hatch out they are tailed froglets that crawl onto the adult males back. They remain on his back as they develop over the coming weeks. 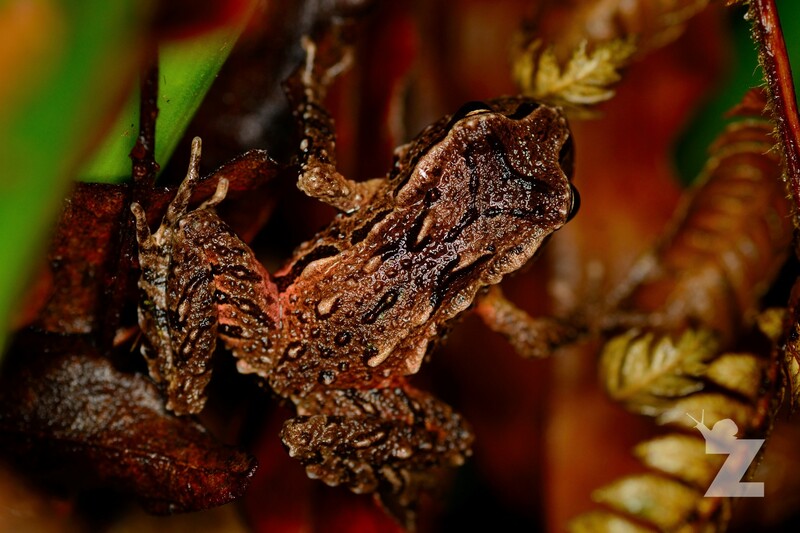 Archey’s frog is the smallest New Zealand Frog measuring less than 38mm. This species is terrestrial (or ground dwelling) but may climb several meters into foliage during the night, before returning to their ground-level retreats at dawn. What Threats do the Archey’s Face? The greatest threats to Archey’s are chytridiomycosis, introduced predators, pollution, habitat modification and destruction. Their drastic population decline, estimated to be more than 80% over the last ten years, is probably due to chytridiomycosis. You can read more about chytridiomycosis on the Amphibian Ark website here. 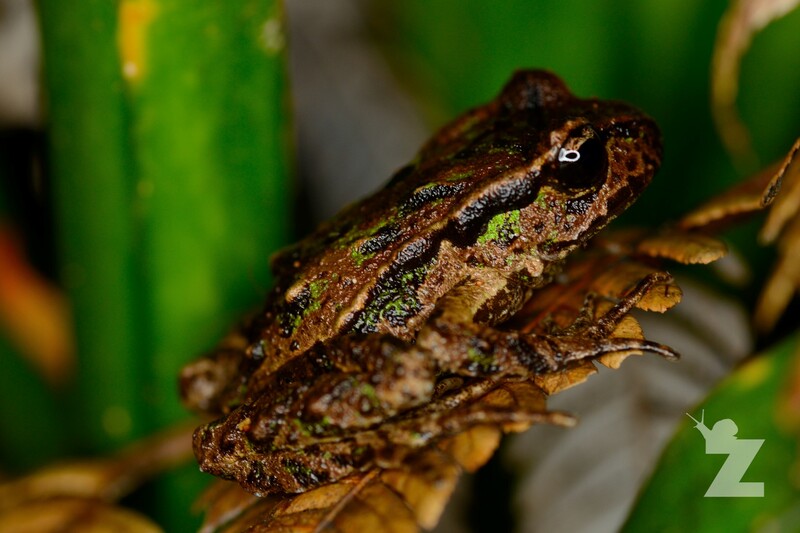 The Department of Conservation recommends to avoid visiting areas where native frogs are found to avoid spreading the amphibian chytrid fungus. If you do visit native frog habitat, you must make sure all your footwear, gaiters and equipment are clean and disinfected. If our post about Archey’s frog wasn’t enough to win you over, the images we took that night certainly must. I can’t stress enough how wonderful these creatures are, and how deserving they are of our efforts to curb further declines. What a special experience to come across those frogs. Thanks for the wider references too, very interesting! Hope that efforts are successful in halting their decline. I share your love for frogs. They are fascinating and so charming!